In the European Union, cancer is the leading cause of death and the overall cancer incidence is still increasing. As a result of expanding efforts to improve cancer outcome, a main paradigm change is occurring in cancer therapy towards individualized medicine. Antibody-based therapies form an integral and constantly growing part of this approach. Antibody-based therapies will strongly influence the coming decade of cancer care. The importance of immunotherapy has been highlighted by the prestigious Science journal as “breakthrough of the year 2013”, heralding the rising importance of immunotherapy. Accordingly the need for well-trained and skilled researchers in academia and industry is dramatically increasing in this field. IMMUTRAIN is an Innovative Training Network which received 3.6 million euros from the European Union for four years (2015-2019). It brings together experts in the fields of monoclonal antibodies, dendritic cells, T-cells and immunomodulatory nucleic acids with a considerable industrial involvement. The network comprises ten academic research groups and five industrial partners in a total of nine European countries. 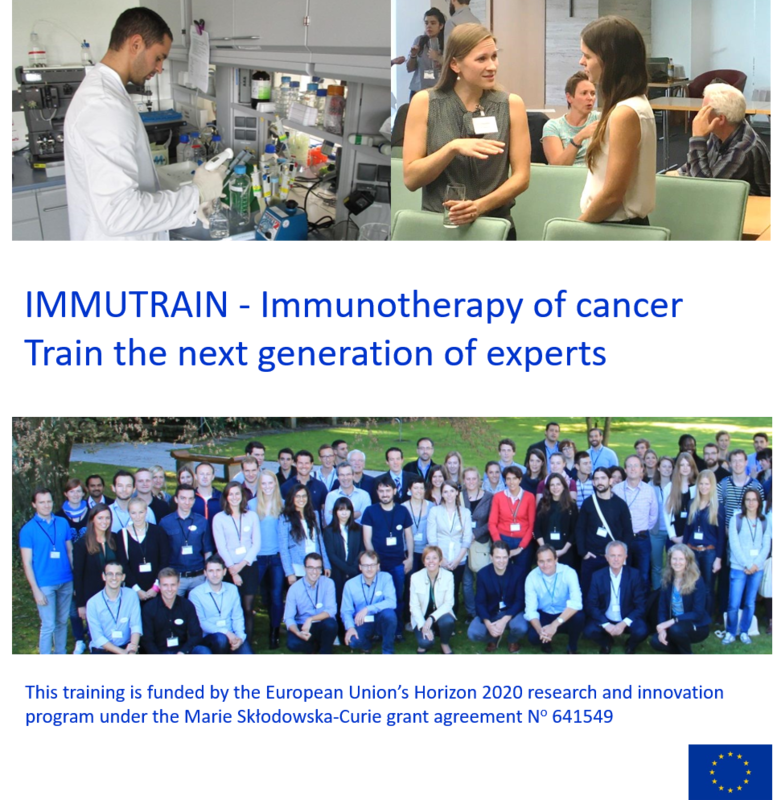 IMMUTRAIN creates actively synergies between those sectors by forming and promoting young researchers to match the challenges of immunotherapies. Particular focus is placed on combinatorial therapies and on the new emerging field of bispecific antibodies used to target both the tumor and the patient´s immune system. 15 Ph. D. students - Early Stage Researchers, ESR - reinforced by the project leaders investigate innovative therapeutic strategies and provide the rationale for future clinical trials. Throughout their projects, ESR learn to integrate academic and industrial aspects and sharpen their experimental and complementary skills in a well-designed and diversified training program.